Une valeur sûre | One quality, the finest. I’m pretty much guaranteed to find a special exhibit to enjoy at the musée des Arts Décoratifs. It’s une valeur sûre (oon valur soor), a “secure value” or we’d say “a sure thing.” This year, there were three interesting exhibits to enjoy. The biggest, and most impressive was Louis Vuitton – Marc Jacobs (until September 16, 2012), the most charming exhibit was Les Histoires de Babar (until September 2), and the Trompe l’oeil exhibit will run the longest (until November 15, 2013). I’ll just talk about the first one today and save the rest for another day. The Louis Vuitton – Marc Jacobs exhibit was presented on two floors: one dedicated to the founder of the famous monogram-bedecked brand, and the second devoted to the current artistic director. Personally, I was far more interested in the Louis Vuitton floor. The exhibit did a great job of showing the luggage maker’s genius in seizing upon the birth of haute couture to propose the proper box to store all those complicated clothing items. 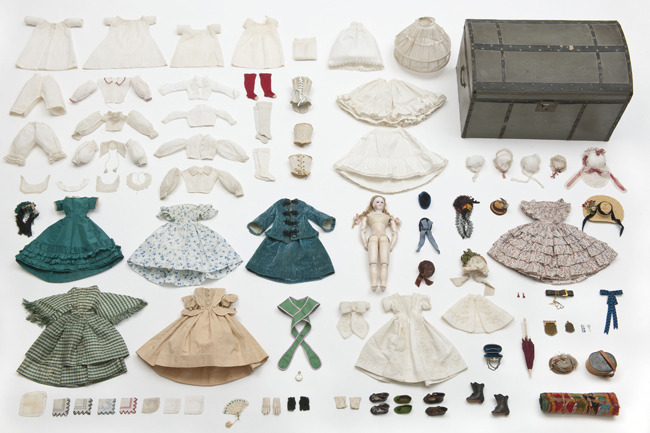 The first windows used doll clothes to illustrate the staggering array of dresses and accessories required by a member of the bourgeoisie. I couldn’t help thinking of my favorite childhood book A is for Annabelle that taught the alphabet through all the various items in a doll’s trunk. The exhibit showed the 30 (!) 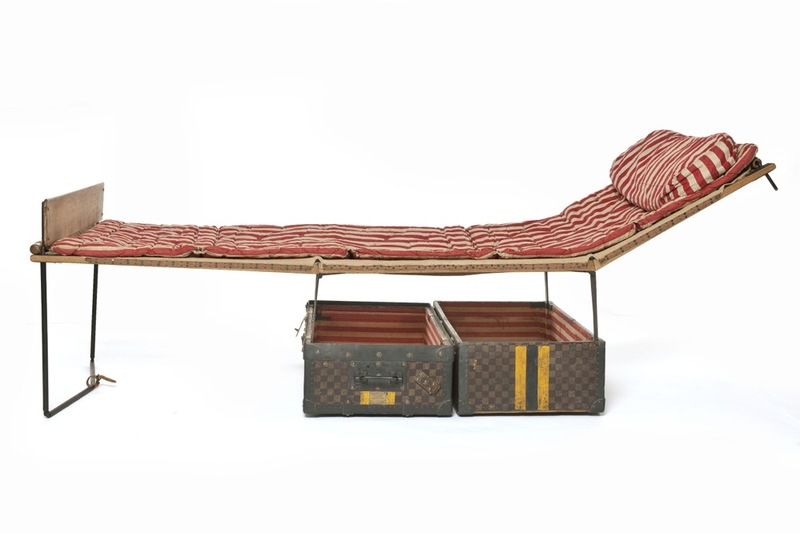 different trunks Monsieur et Madame would have needed for a typical journey. There was even a specialized trunk to hold a folding cot. The Marc Jacobs floor presented highlights from the last 15 years. It was interesting to see how he worked the LV logo into various pieces of clothing; sometimes the effect was almost subliminal instead of the overt display I usually associate with the brand. This entry was posted in Events, Fashion and tagged A is for Annabelle, Arts Décoratifs, Louis Vuitton, luggage, Marc Jacobs, Musée des Arts Décoratifs Paris. Bookmark the permalink. I wonder why they didn’t sew the sleeves on to the blouses…. it looks like they just packed extra sleeves and collars… how odd. I’d noticed that too. I suppose the idea was that some items needed to be laundered more frequently, but that’s only conjecture on my part. Does anyone out there know for sure? Pingback: Costume d’une agreeable couleur verte | One quality, the finest. Well, dipping into that great pool of knowledge that I have acquired over the years, the result of being married to an absolutely fabulous woman, I believe that the detachable sleeves are what are called “Engageantes” and they are meant to be worn under the pagoda sleeved dresses. The green and while striped dress and the blue velvet dress in the picture are pagoda sleeved dresses. And you grow more wonderful each day. Oh and yes, they were generally made of a lighter material and easier to launder. Good, I was right about the laundry. You’re worrying me. I think we need to cancel the lawn service so you have a reason to stop researching women’s sleeves. Pingback: Le Saut du Loup | One quality, the finest. Pingback: Un emballeur | One quality, the finest. Pingback: Déboutonner la mode | One quality, the finest.